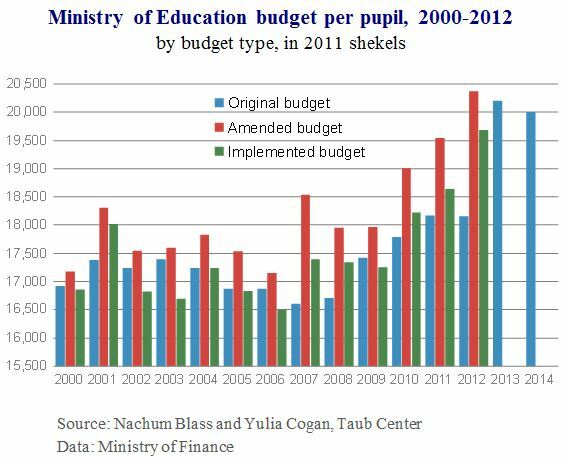 Taub Center research shows that the Ministry of Education budget grew between 2000 and 2014 although investment per pupil is still low relative to the OECD. In addition, when examining the budget, it is very difficult to determine the considerations underlying the allocation of resources and in particular the reasons for the changes to the budget over the course of the year. The State budget, and in particular the Ministry of Education budget, expresses the priorities of the government in allocating available resources. 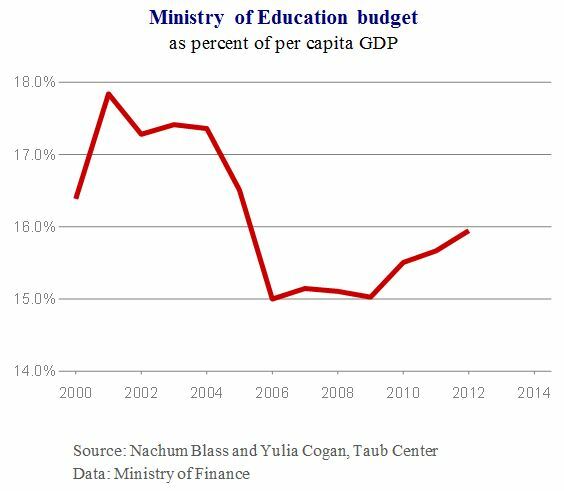 The policy paper “The Ministry of Education Budget 2000-2014: Trends and Issues,” by Nachum Blass and Yulia Cogan of the Taub Center, examined the developments in the Ministry of Education budget between the years 2000 and 2014, with an emphasis on the utilization of the budget and how it reflects those priorities. The authors examined the size of the Ministry of Education’s budget, looking at measures such as the budget level relative to per capita GDP and relative to expenditure in other OECD countries. The study found that during the period in question, the Ministry of Education budget grew in absolute terms; over the course of 2000-2012, the implemented budget (that is, the final amount that was actually spent on education) grew by 45%. Taking into consideration the increase in the number of pupils over this same period (24%), the extent of the rise is less impressive, although the positive trend is clear. In contrast, when the budget per pupil is examined relative to per capita GDP, somewhat different trends are found, as can be seen in the first figure. Generally speaking, until 2006, the per pupil budget relative to per capita GDP declined, while thereafter, it remained stable with a slight rise. An international comparison also confirms that the rise in the Ministry of Education budget is not enough to close Israel’s gap relative to other countries. The second figure shows clearly that the OECD countries place greater importance on education at every educational level. 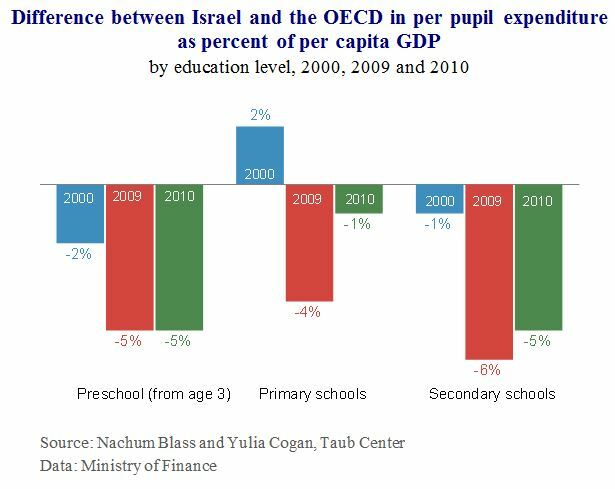 It is also apparent that the expenditure gap between Israel and the OECD on preschool education and secondary education grew over the research period, and during this same time, the trend in primary education expenditure flipped from a positive gap (being in Israel’s favor) to a negative one. Nonetheless, since the implementation of the Ofek Hadash [New Horizon] teacher wage agreements began in primary schools in 2008, there has been a significant change. The rate of per pupil expenditure rose rapidly, while per pupil expenditure in the OECD countries stagnated and even declined slightly. In light of the fact that the effects of the Oz LeTmura [Courage to Change] wage agreement with secondary school teachers will only be seen in the 2012-2015 data, and that the full implementation of the Compulsory Education Law for Ages 3-4 will only take place within the next few years, it seems likely that the current trend towards improvement will continue and strengthen. Another important subject that was examined in the Taub Center research was the transparency of the education budget. When looking at the budget, it is customary to distinguish between three budget types: the original budget – the one that is approved by the Knesset and is accurate as of January 1 of each year; the amended budget – which is the budget following additions and changes approved by the Knesset Budget Committee; and the implemented budget – the budget that was actually utilized by December 31 of a given budget year. Utilization of the budget during the examined period was an average of about 102% of the original budget but only about 96% of the amended budget. On the surface, this seems very impressive, especially relative to the original budget. In shekel terms, however, the significance is that in the 2012 budget, for instance, the Ministry of Education neglected to use some NIS 1.34 billion of its budget. As can be seen in the third figure, the differences between the three budget types remain fairly constant over the years. Numerous items within the Ministry of Education budget were reviewed in detail in this study, and in each one, substantial differences were found between the original budget and the implemented budget. So, for instance, there is a budget line called “Reducing the number of pupils per class.” Between 2009 and 2011, NIS 218 million was budgeted for this purpose. Nevertheless, in the final implemented budget, the item is listed as NIS 0. Whether or not there was ever any actual intention to use the funds for their stated purpose, it is clear that this budget line and many others were not in fact utilized for the purposes laid out in the original budget. Quite unfortunately, the public may never know the fate of these funds. In summary, Blass and Cogan conclude that the Ministry of Education budget is not transparent to the public, primarily due to differences between the various budget types. These differences, as well as the many transfers between budget items – and in particular, between the many unspecified, reserve items – make it very difficult to track the actual utilization of the budget. In fact, they make it impossible for the engaged public to check if the Ministry is indeed standing by its obligations and carrying out its declared programs.